Explore the key elements of brooch functionality. Experiment with alternative designs to existing solutions. Use limited tools to create a brooch from a single piece of metal. – What mechanisms do we use to make a brooch stay firmly on your clothes? We jewellers have an array of fixtures and fittings available for purchase, that we normally solder (or glue ˚∆˚) to our designs. But many of these are downright ugly, or ineffective, and often not suitable. With a little ingenuity we can break away from tradition to find clever ways of designing that give subtle delight to the maker! Are you ready to take the challenge of the One-Piece Brooch? 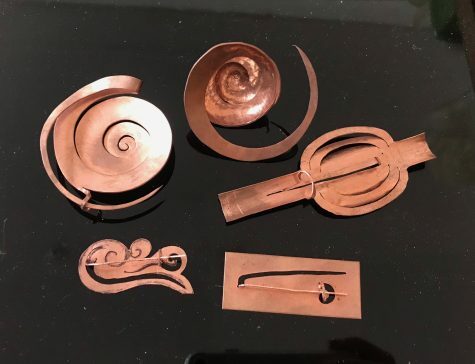 The aim of the course is to design and make a unique brooch (which you will wear home) that is made from one piece of metal, with no additions. No Solder, no glue, no rivets. Which techniques are we left with? Initial experiments with card will set us in a direction, but metal has an entirely unique set of characteristics that allow us to change size and shape with a single hammer blow. Drilling, cutting, filing forming and forging all take on new and challenging significance as we seek to make our brooch. For more advanced students, the one-piece brooch provides constraints that offer a fabulous way to re-invigorate your creative practice. Working with strict limitations can be conversely liberating as we are forced to push against these boundary walls in search of a satisfactory conclusion. And so we find ways to re-explore techniques, expand our technical skills and think laterally. It’s anticipated that you will produce numerous exploratory ideas in card, and at least one copper prototype brooch. Your final piece, in silver, will be a culmination of your tests, prototypes and developing ideas. The course fee covers the cost of non-precious materials, and you will also be provided with some silver to make your brooch. If you would like to have your brooch hallmarked with the Flux Studios hallmark this can also be arranged at cost price. More info will be provided at the time of booking your place. This fee includes all materials for your use. Refreshments will also be provided. Please check your eligibility before choosing the concessionary option. *If you are a UK residents and on a low wage, or in receipt of tax credits or other benefit you qualify for the Flux concessionary rate. This is a discretionary discount which we personally subsidise. Please consider how much you need this discount before choosing the concessionary option.